This beautiful solid silver dressing table jar or canister was made by the reputed William Comyns and is dated London 1899. 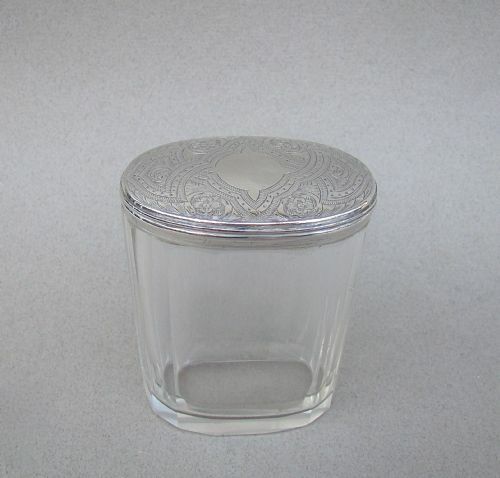 Both cylindrical body and pull-off lid embossed with the very sought-after Reynold's angels pattern. Date letter "c" for 1899. Silver in very good condition, no creases or dents. 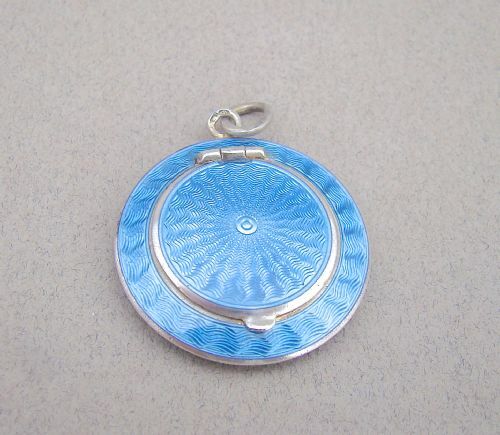 This is a wonderful silver mounted pale blue guilloche enamel circular compact. The enamelling is on both sides, which is a testimony to the high quality of the piece. The hinged cover opening to reveal a gilt interior. Fitted with the original mirror and powder puff with a suspension ring. Diameter: 3.5cm / 1.1 inches. No loss to the enamel. Interior gilding in equally good condition. 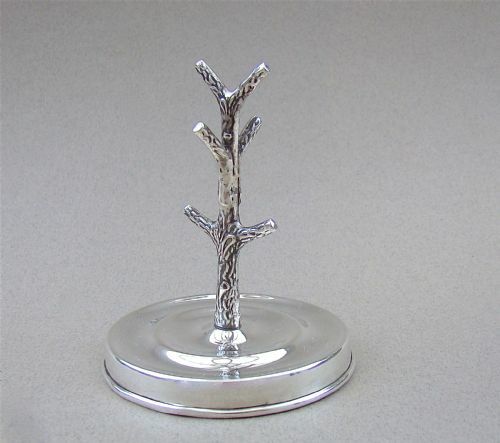 This is a good quality solid silver ring tree made by J & R Griffin and dated Chester 1919. The finely textured hollow silver tree with six branches. The trunk emanating from a plain circular loaded base. Date letter "t" for 1919. Tree in good condition with no holes or dents. Height: 7.5cm - 3 inches. Base diameter: 6.5 cm - 2.4 inches. 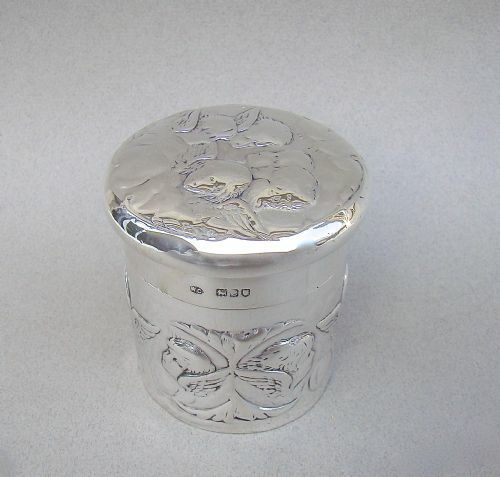 This is a charming solid silver dressing table jar made by the prolific William Aitken and dated Birmingham 1904. The plain cylindrical body fitted with a pull off lid embossed with floral scrolls surrounding a vacant circular reserve. Gilt inner lid and pot. 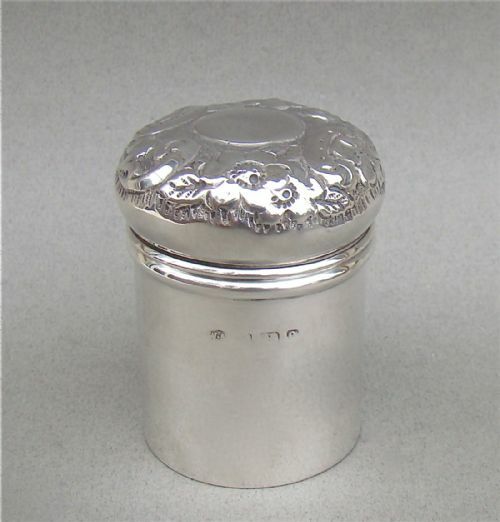 This is a very unusual and rather quirky small silver mounted dressing table jar. 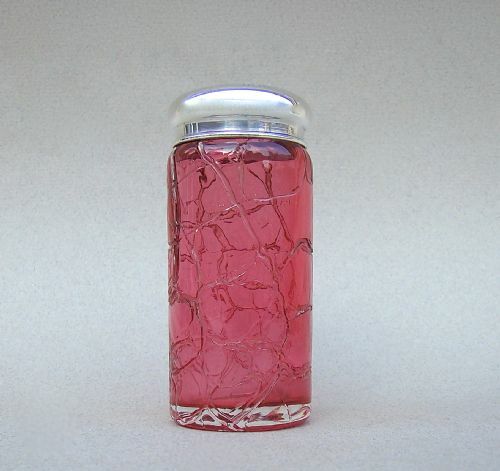 The cranberry glass cylindrical body engraved in a "mock" crocodile skin pattern and fitted with a silVer neck. The neck with hallmarked pill-off cover. W&CO for Wolfsky & Co. The silver lid with minor surface unevenness, commensurate with age. The glass in very good condition with no chips or cracks. Diameter 3.5cm / 1.3 inches. Height: 9cm / 3.2 inches. This pretty mid-Victorian dressing table jar bears the hallmarks of Thomas Whitehouse and is dated London 1878. The panelled glass body with a pull-off solid silver silver top engraved with Gothic style strap work decorations. It is a useful size for toiletries, tall enough for example to store cotton buds, as can be seen on one of the images. Date letters "C" for 1878. Width: 6cm / 2.2 inches. Depth: : 4cm / 1.4 inches. This fabulous silver and guilloche enamel jar is dated Birmingham 1929 and was made by the Northern Goldsmiths Company. The exquisite sunburst patterned guilloche enamel lid is surmounted by a distinctive Art Deco silver finial. The squat clear glass body is star incised at the base. The lid with interior mirror. This is the nicest dressing table jar I have had. 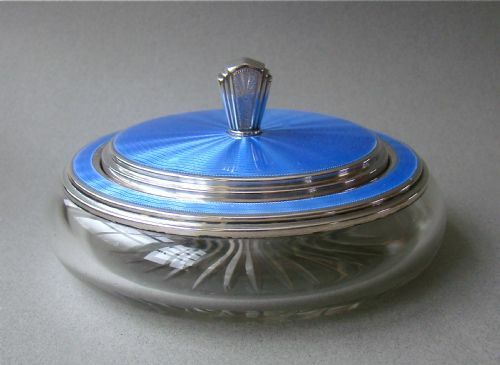 The design is very elegant, the enamel is a wonderful powder blue colour and is in pristine condition. It is so much of its period. NG Co for the orthern Goldsmiths Company. Date letter "E" for 1928. Height: 6.5cm / 3.2 inches. Diameter at widest: 12 cm / 5 inches. This stunning Art Deco silver and vivid yellow guilloche enamel jar is dated London 1937and was made by the sought-afterMappin & Webb. 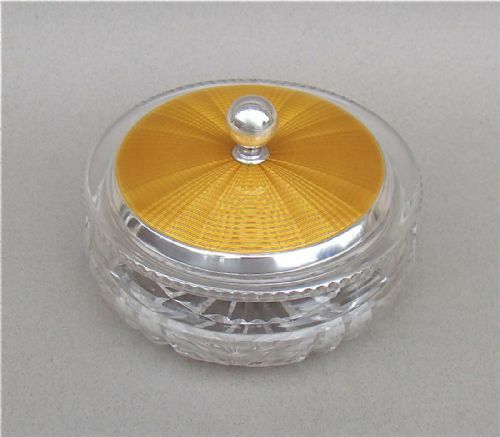 The exquisite sunburst patterned guilloche enamel lid with solid silver finial. Fitted on a clear glass body incised with geometric patterns. Mn&Wb for Mappin & Webb. Date letter "B" for 1937. Diameter: 14cm / 5 inches. 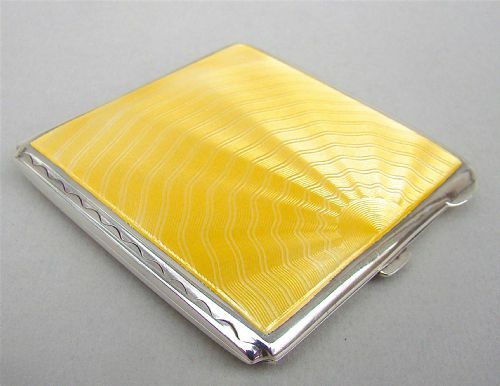 This is a wonderful silver mounted guilloche enamel compact in a fabulous yellow colour. Of square form with sunburst decorations. The hinged cover opening to reveal the original mirror and removable attachment for powder fitted in a gilt receptacle. The back with engine-turned decorations. JD&S for James Dixon & Sons Limited. Date letter "P" for 1939. 7cm x 7cm / 2.6 inches x 2.6 inches. Interior in equally good condition. 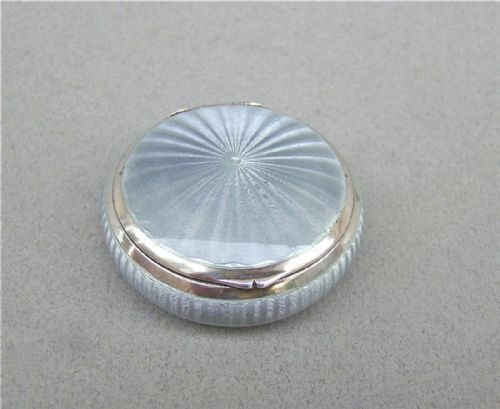 This fabulous Art Deco silver pill box has a stunning pale grey guilloche enamel lid with guilloche enamel border. Plain sides and base which enhance the beauty of the lid. Diameter: 4.5cm / 2 inches. No dings or dents on base and sides. Some scratch marks on gilt on inner lid. 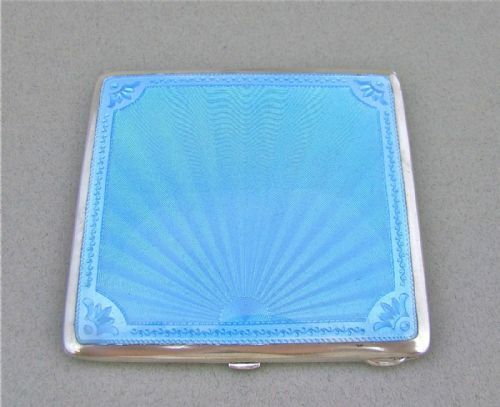 This is a wonderful silver mounted guilloche enamel compact in the sought-after powder blue colour. Of rectangular form, the sunburst centre within a border exquisitely decorated with garlands and stylised flowers. The hinged cover opening to reveal the original mirror and removable attachment for powder. The back with engine-turned decorations and monogramed with the letter "B"
7. 5cm x 7cm / 3 inches x 2.6 inches. 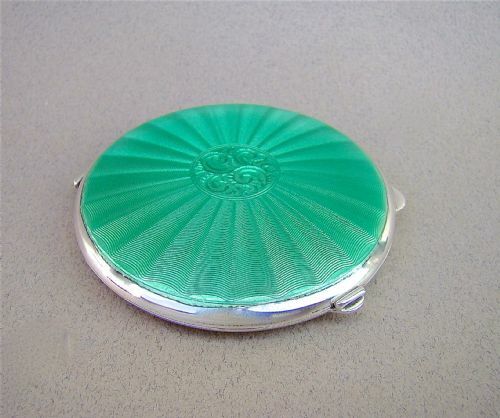 This stunning silver mounted green guilloche enamel compact is dated Birmingham 1922. The circular hinged cover with radiating green guilloche enamel decorations and centered by a roundel decorated with foliate scrolls. The interior fitted with the original mirror. J.G Ld for Joseph Gloster. Date letter "w" for 1922. Diameter: 7cm / 2.4 inches.